The nineteen of Tammuz is my mother's yahrzeit. My mother died on July 6, 2015, and observing the customary mourning period was challenging. I missed several weddings and bar mitzvahs of close friends and neighbors, and I sorely missed listening to music and going to live events.The Jewish custom is to honor a loved one's memory by doing good deeds and giving to charity, and I undertook a project "for the elevation of the soul of Chana Rachel bat Moshe." I also started knitting, something my mother enjoyed, but was never able to teach me. Now that the second yahrzeit is approaching, I am finding that I can look farther back than the recent past, recount stories and silly songs and corny jokes to her grandchildren, and reflect on what was a complicated relationship. How does a librarian do that? With books. 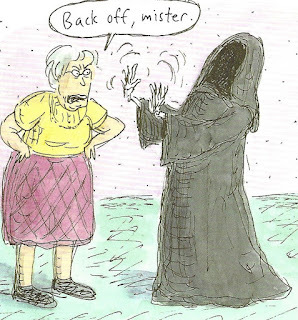 I have been a fan of Roz Chast since she started at the New Yorker in 1978, which is about the time I started reading the New Yorker, which means looking through the magazine to get to her cartoons. Her 2014 memoir, Can't We Talk About Something More Pleasant? (Bloombury) chronicles her parents' decline and demise. She "could see that they were slowly leaving the sphere of TV commercial old age -- and moving into the part of old age that was scarier, harder to talk about, and not a part of this culture." Although my mother's trajectory was different, I dealt with many of the same issues including the lifetime accumulation of such clutter as old eyeglass frames and free gifts from opening bank accounts; sorting through endless financial and medical papers; and that pull between spending time visiting her at a senior facility versus spending time with my children. Hilarious, touching and spot-on, I mostly laughed and sometimes cried (and sometimes laughed until I cried). It seems I am not the only one who felt like their father's daughter and heard, "I'm not your friend; I'm your mother" many times. My mother also had a fearsome temper and a strong aversion to doctors, whom she "knew" were in cahoots with the pharmaceutical and insurance companies to overcharge and prescribe drugs so they could go to conferences in Hawaii. But perhaps this tenacity was what enabled both women to live past 90. 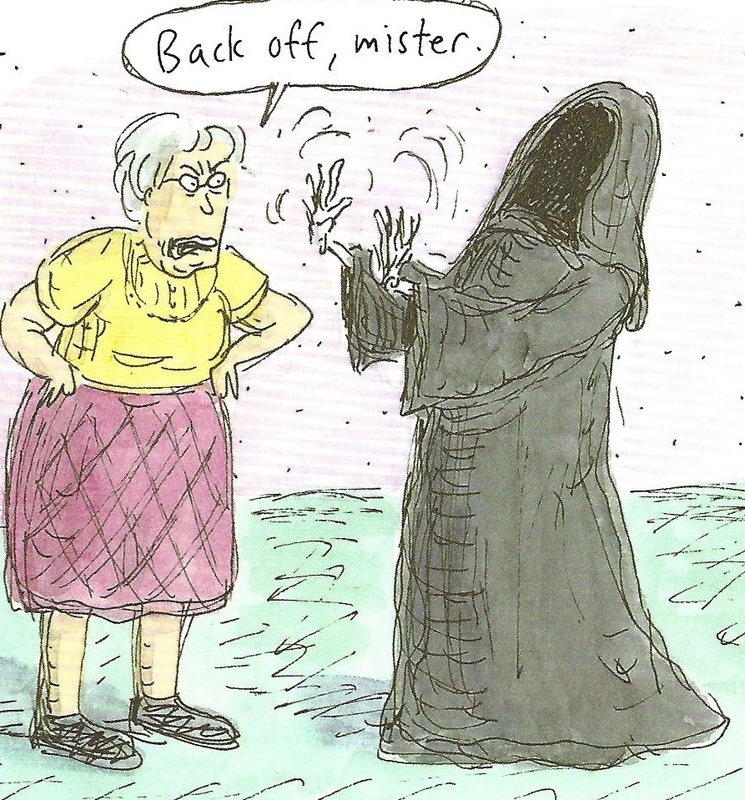 My mother, a"h, cheated the Angel of Death many times. She outlived the "normal" diagnosis for Alzheimer's patients. She collected every penny of her long-term care insurance, and lived way past the expectancy for those who break hips. She was in and out of ICU several times. She was hospitalized on 19 Tammuz of the previous year, and a rather inept doctor encouraged us to "let her go and stop being selfish." Well, the gauntlet was thrown down. My mother lived another year, just to show the doctor that she was horribly wrong. 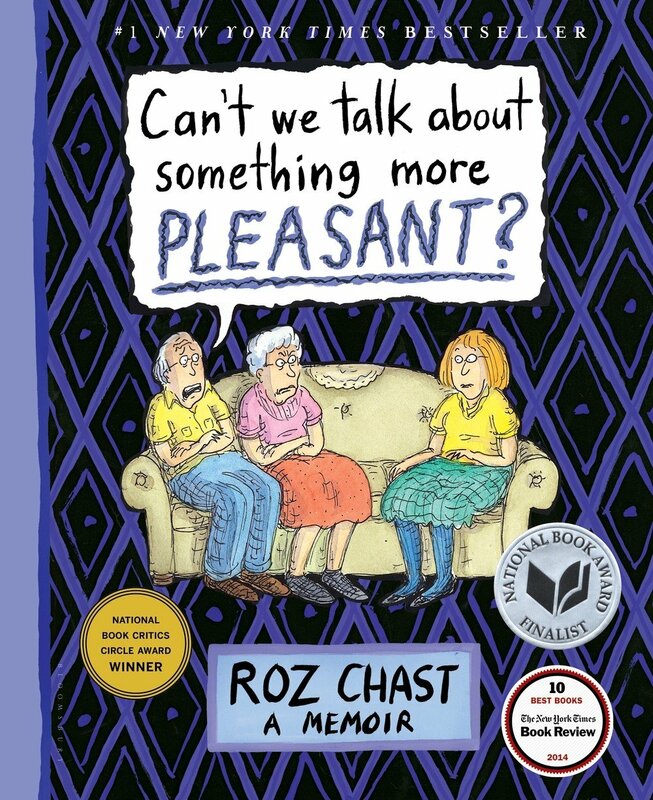 ©Roz Chast, 2017, ‘Can’t We Talk About Something More Pleasant?’, Bloomsbury Publishing Plc, used with permission. 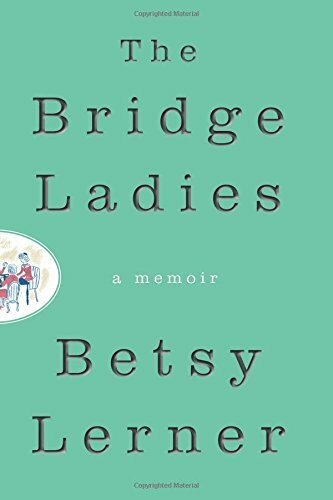 Another memoir, The Bridge Ladies by Betsy Lerner (Harper Wave, 2016) is about Betsy's mother and her mother's bridge partners. Growing up, Lerner saw them as a group of suburban housewives who got together once a week around a card table, but as a grown up, she discovered a new respect for these women who show up every Monday, always dressed tastefully and with accessories, and have a friendship defined by a love of the game and a presence in each other's lives. My mother did not play bridge with the ladies, but she and my father enjoyed playing with other couples. They would set up the card table in the living room, put out some bridge mix (best part of the game for me. Interesting fact: the chocolate covered nuts and confections seemed to be the perfect snack for card players), and spend the evening playing cards and talking. This is another one of her hobbies that she tried to teach me and that I couldn't master, which might be a good thing, since none of my friends play bridge, either. But Lerner practiced the game and improved, learn the intricacies of play, and bonded with her mother over the game. Lesléa Newman's I Carry My Mother (Headmistress Press, 2015), is also a chronicle of her mother's dying and death in a series of poems that vary in style, format and tone that follow both her and her mother's journey during this time. She touches on all phases of the mother-daughter relationship as well as the physical and emotional challenges for both parent and child. Newman found inspiration in classic Dylan Thomas, Robert Frost, Wallace Stevens and Dr. Seuss works, as well as more modern voices. Her own voice shines through with rhymes that are full of love, sadness, and often irony. She vividly captures the experience: "My mother tells me where she hides her jewels/a nurse comes in to ask about her stools." And in the aftermath "but I know, too, that my mother is involved in everything I know." Thanks to AJL super-colleague Rachel Kamin for suggesting these books on several platforms, and for the Hashgacha pratis that I got to read them when I did -- another example of bibliotherapy. Night, sleep, and the stars." I am to see to it that I do not lose you." Finally, not one of the Real Cats of Israel, but the best cat ever, Connie, whom my mother trained to not go upstairs and not jump on tables or counters. 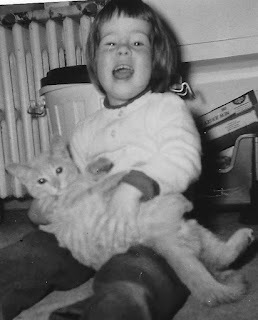 Everyone thought they were Connie's favorite human, but Connie was very smart -- she knew who was in charge of the food (and who didn't chase her around the house to try and play with her), so my mother was Connie's best friend. Thank you for sharing the wonderful way you remember your mother! As a fellow librarian, I hope to use your idea to remember my mother in my blog on her yarzheit in Kislev. Thank you, Malkah. I'm looking forward to seeing which books elicit fond memories of your mother, a"h, for you. This is wonderful, Chava! I am so glad that these books were meaningful, inspiring, and enjoyable for you. May your mother's memory always be for a blessing. Sending my love . . . Thank you, Rachel. As Raganathan noted in his 5 laws of library science, there is a book for every reader, and a reader for every book. When they come together, it is an amazing thing. 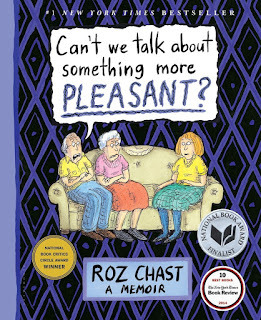 Thank you for including my book along with the likes of Roz Chast and Betsy Lerner. My mother also knit and played bridge, two things I do not do. It's been five years and I still miss my mom every day. May your mother's memory be for a blessing. These ladies get to share the spotlight with the likes of you!! this trifecta was a winning combination: some humor, some similar situations, and some of the poetry my mother, a"h, loved to set a more contemplative tone. I am sure your mother is meilitz yosher (advocating in the heavenly courts) for you and shepping a lot of nachas.